Finding a good casino online isn't easy, despite what some might think. There are a lot of online casinos, and selecting the right one from such a large number depends a lot upon personal preference. Online gaming may have become so popular in recent years for the simple reason that there are so many options available to people. Swiss Online Casino is a very attractive, streamlined casino with a beautiful look and a lot of great things to offer its gamblers. It might not stand out as much as similar casinos, but the large number of incentives and bonuses are a great reason to check them out. 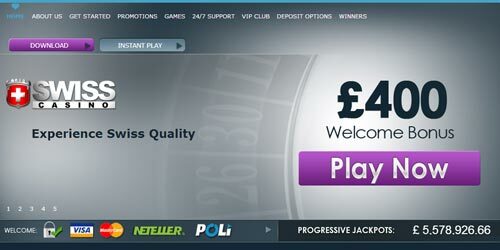 Signing up with Swiss Online Casino is easy. The site offers various different incentive casino bonuses depending on when you sign up with them. Currently, Swiss Casino offers a signup bonus matching up to $100 of whatever your initial deposit is. It's important to use a valid credit card as there is an offer code that needs to be entered when you get your welcome email. Swiss Casino offers plenty of games. These include online slots, table games, video poker and more. The games are all really sleek looking and use a number of different skins to make them stand out from one another. The site might not have the biggest variety of games in the world, but there should be more than enough here for a beginning and intermediate gamer to get started. The site has a really nice interface, though it doesn't really stand out much in comparison to similar online gaming sites. In general, the site is easy to navigate and the software is good. It's designed by Playtech, makers of a lot of online casino software. Their software almost always runs smoothly. The game visuals are very colorful, and the varieties of different games all have a unique look to them. Overall, Swiss Casino is a nice looking and operating casino. There are a decent number of games, they're easy to play and the Playtech software runs very well on most operating systems. The only real issue with Swiss Casino is that there's not really that much that makes it stand out from all the other sites as I said earlier. The incentive bonuses are nice, but lots of sites offer those as well. This casino is worth signing up for only if it strikes you as particularly interesting.